Arkane Studios has officially completed development of their assassination game Dishonored. The game, Arkane's first since being bought by Bethesda parent ZeniMax Media, will be available worldwide in multiple languages on the PS3, Xbox 360 and PC within two weeks. Dishonored stars Corvo, the former bodyguard of the Empress who was framed for her murder. While in prison, he's visited by a supernatural being known as the Outsider who gives him a chance at revenge. Armed with supernatural powers from the Outsider, as well a host of weapons and gadgets, Corvo sets out to punish those who wronged him. The most notable feature of Dishonored is its non-linear structure. Players are the ones deciding how to complete their missions. They can be sneaky or aggressive, lethal or peaceful. It's said that the game will change depending on these decisions as well. In order to celebrate Dishonored going gold, Bethesda is holding a giveaway. They're going to send one lucky fan an Overseer mask as well as a signed copy of the game. 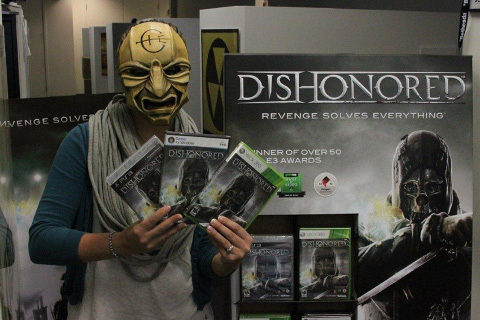 For a chance to win, email [email protected] with the subject line “Dishonored is Golden." In your email, mention your name, mailing address and a story explaining why you're excited to play Dishonored. Entries must be received by 11:59 EST on October 4th in order to be eligible. Additional fine print can be found here. Dishonored will arrive in North America and France on October 9th. Australia and Spain will receive it on the 11th. The game will launch in other European countries on the following day.